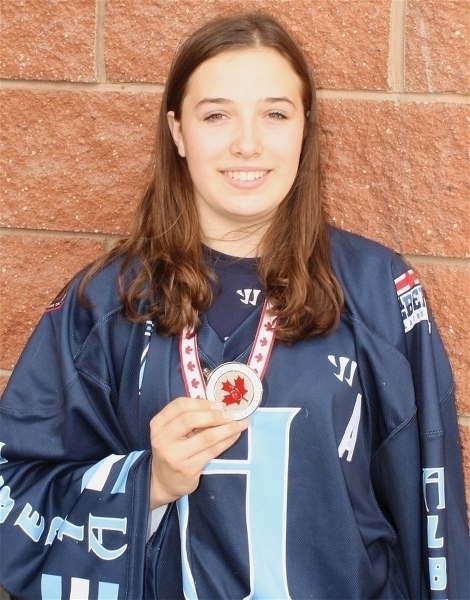 A Westlock teen played a key role in the Alberta Girls Midget Lacrosse team bringing home a silver medal from the nationals in Calgary last month. Britannie Ouimet was among 20 players on Team Alberta who battled for the gold in Calgary at the Female Box Lacrosse Nationals July 21-25. Alberta was one of four teams at the tournament, sharing the floor with clubs from Ontario, Nova Scotia and British Columbia. The four squads played an eight-game round robin to seed for the final. After trouncing Nova Scotia 10-0 before edging Ontario 3-1, the girls fell 6-1 to British Columbia. They then exploded with a decisive 9-1 victory over Nova Scotia before crushing Team Ontario 8-1 to clinch a berth in the final. The team then went on to play British Columbia a second time, losing 5-4, before facing them yet again in the final. After a close match, the game ended in heartbreak. “We were tied 3-3, and with about a minute-and-a-half left they scored to make it 4-3,” said Ouimet. Ouimet said that despite the tough finish, the team’s accomplishments far overshadow any personal disappointments. “This was the first time an Alberta team, girls or boys, made the final, so that was really exciting,” said Ouimet. “And also the fact it was held in Calgary — it was also the first time Alberta ever hosted a national final. Ouimet credited the team’s success to its solid defense. “B.C. has five girls that are six feet tall, or taller,” said Ouimet. With the long lacrosse season finally over, Ouimet isn’t sure what her future plans are. She added that she was very grateful to have played for Team Alberta. One thing that Team Alberta does yearly is a charity drive. This year the team assembled close to 60 backpacks of clothing and goods to help homeless people in Edmonton. On July 31 Ouimet and her family put on a barbecue outside of the Sobeys in Westlock to raise funds retroactively for the tournament. Ouimet added that she was very thankful for the support she received in the days and weeks leading up to nationals.